Where Did Planet Nine Come From? 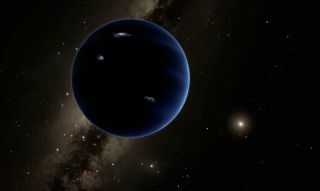 Artist's illustration of Planet Nine, a hypothesized world in the outer solar system thought to be about 10 times more massive than Earth. It's unclear whether Planet Nine exists, but astronomers are already digging into the mystery of the hypothetical world's birth. In January, Konstantin Batygin and Mike Brown of the California Institute of Technology in Pasadena announced that they had inferred the existence of Planet Nine based on the strange orbits of a half dozen small bodies in the Kuiper Belt beyond Neptune. Some astronomers are now scanning the sky in an attempt to find the putative planet, while others are tackling another mystery: How did Planet Nine come to be? There are a number of possible origin stories, researchers say. For example, Planet Nine may be a former exoplanet that was captured by our solar system's gravity. This scenario appears to be far-fetched, however. Gongjie Li and Fred Adams, both of the Harvard-Smithsonian Center for Astrophysics (CfA) in Cambridge, Massachusetts, performed computer simulations to estimate the odds that Planet Nine was plucked from a passing star system or nabbed as a formerly free-floating "rogue planet." In both cases, the odds are less than 2 percent, the researchers report in a new study. So it's likely that Planet Nine is native to our solar system. But did it form in its present location, or begin life much closer to the sun and then get booted into the outer solar system by a gravitational interaction of some kind? Both scenarios are possible, Scott Kenyon, of the CfA, and Benjamin Bromley, of the University of Utah, report in two new studies of their own, which are also based on computer modeling work. Given the right initial conditions, Planet Nine could have coalesced near where it's now thought to lie within 1 billion to 2 billion years of the solar system's birth, Kenyon and Bromley found. But their simulations also give credence to the idea that interactions with Jupiter and Saturn kicked Planet Nine out from a formerly tighter orbit. "Think of it like pushing a kid on a swing: If you give them a shove at the right time, over and over, they'll go higher and higher," Kenyon said in a statement, adding that this scenario is "the simplest solution." The gravitational boot, if it occurred, didn't have to come from a fellow planet. In their paper, Li and Adams also considered the possibility that Planet Nine was tugged outward by one of the sun's stellar neighbors. But their simulations pegged the probability of this scenario at 10 percent at best, suggesting that, in most cases, a passing star would have kicked Planet Nine out of our solar system completely. So the fog of mystery surrounding Planet Nine remains thick. But that fog could clear someday, provided that this mysterious world actually exists — and astronomers are able to get a decent look at it. "The nice thing about these scenarios is that they're observationally testable," Kenyon said. "A scattered gas giant will look like a cold Neptune, while a planet that formed in place will resemble a giant Pluto with no gas." The study by Li and Adams has been accepted for publication in The Astrophysical Journal Letters. Kenyon and Bromley have submitted their two papers to The Astrophysical Journal.